Nestle into the latest edition of Virtuoso Travel magazine to find new inspirations for your next adventure. Live in the now! Expand your horizons! Experience the sights and sounds of your dreams to create memories that will last a lifetime. Being a member of the Virtuoso Network allows me to offer you premium travel options. Tapping into more than 1,700 preferred global partners, top hotels, cruise lines, tour operators, and more, I can elevate you to first class travel and help you live like a VIP. Because, why not live well? 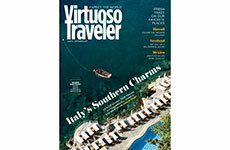 There’s a little something for everyone in this Virtuoso Traveler edition! From wilderness safaris in Scotland to chilling in Antarctica, you’ll find unique options a little off the beaten path. Give the “Two Big City Adventures for Two Budgets” article a read! Find out how to “splurge” or “steal” and have a great time! From wilderness safaris in Scotland to wine tasting in Mexico, fresh ways to explore our favorite destinations. In Vienna’s top museums, an emerging class of cafés has elevated eating, drinking, and relaxing to a fine art. Serious sustainability efforts are luring wildlife lovers to this southern African refuge. As always, we’re here to help you achieve your dream travel goals. Let’s have a conversation about what’s right for you. Please get in touch.